When the Holy Spirit enters into our lives, He begins transforming us from the inside out. A vital part of that work is the transformation of our minds. God doesn’t call us simply to follow Him blindly. No, “it is not good to have zeal without knowledge” (Proverbs 19:2). Instead, our faith is to be tempered by critical thinking. God wants us to delve ever deeper into His Word and to study the world around us in the light of that Word. All Christians are called to be thinking Christians. That’s not to say, of course, we can ever fully plumb the depths of God’s knowledge and wisdom. We can’t. In fact, St. Paul reminds us of the same in the passage directly preceding his call to the renewal of our minds: “Oh the depths of the riches of the wisdom and knowledge of God! How unsearchable His judgments, and His paths beyond tracing out!” (Romans 11:33). God’s thoughts are infinitely above our own. It can be easy as Christians to leave it at that. “Yes,” we might say, “God is at work in His creation, but the ways in which He works are infinitely beyond our understanding.” As a result, it is easy to become satisfied with merely knowing the simplest Sunday school answers to questions of faith. The author of Hebrews calls us not to be content with such a basic knowledge of the faith; we should strive for an ever deeper understanding of God’s Word and His works. “Though by this time you ought to be teachers,” the author chastises, “you need someone to teach you the elementary truths of God’s Word all over again. You need milk, not solid food! Anyone who lives on milk, still being an infant, is not acquainted with the teaching about righteousness. But solid food is for the mature, who by constant use have trained themselves to distinguish good from evil. Therefore let us leave the elementary teachings about Christ and go on to maturity” (Hebrews 5:12-6:1). We should strive for an ever deeper understanding of God’s Word and His works. Sometimes as Christians we assume we’ve learned all we need to know. We’ve done our time in Sunday school and Confirmation, and now we’re finished. We’ve “graduated,” as it were. But the fact is, when we stop trying to understand more about our faith, we inevitably begin to forget even the basic things we once knew. We stop looking daily into God’s Word. We stop spending time in prayer. Bit by bit, we let the cares of this world choke out the seed of faith. And though we may spend our entire lives in the Church, we suddenly find ourselves in need of the same criticism: by this time we really ought to be teachers of the faith; instead, we need a refresher on the very basics of Christianity. We must be vigilant in seeking the transformation of our minds. The devil, the world, and our own sinful natures are ever at work, leading us astray with pleasant sounding doctrines which stand in opposition to God’s Word. We live in a society which tells us that sexual licentiousness is not only okay but to be encouraged; in which serving self is the norm; and in which people are told to tolerate all religions as “glimpses” of the same truth. If we are going to sort out truth from falsehood, we must always be learning more—learning why we believe what we believe. Indeed, St. Paul tells us this is the very reason why the transformation of our minds is so important: because when they are renewed, then we will be able to “test and approve what God’s will is—His good, pleasing, and perfect will” (Romans 12:2). 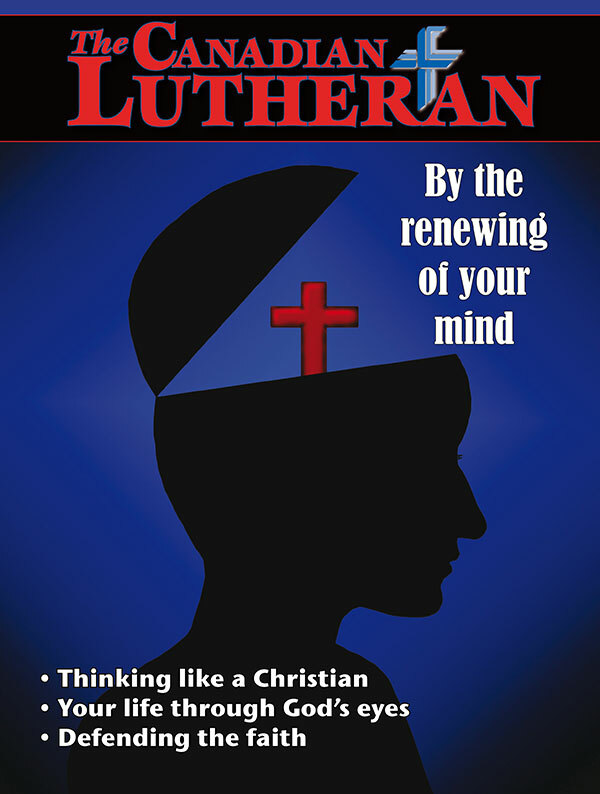 In this issue of The Canadian Lutheran, we are learning to think like Christians. We see how God has called us serve Him with the entirety of our minds. We learn to see our vocations in this world—as parents, children, citizens, laypeople, and pastors—the way God sees them: as God-given callings where He Himself is at work. We learn the importance of defending the faith in an unbelieving world. In short, we learn to love God with our minds. We shall see Truth. And the Truth shall set us free. As we seek a deeper knowledge of Him, we will find that the false teachers of this world become less appealing: we will learn to “discern good from evil,” as the Holy Spirit renews our mind. Then the central tenet of our faith will rise up in our mind’s eye: a cross standing high on a hill above every lie. We will learn to see the world with Christ as its focus, with Christ as the Answer to its every question, and with Christ as the only Salvation for its sin-stained brokenness. We shall see Truth. And the Truth shall set us free. Matthew, this is magnificent. I’m so pleased, proud, and encouraged by the solid, faithful work you’re doing! You’re in my prayers often. “All Christians are called to be thinking Christians.” So true, so true.